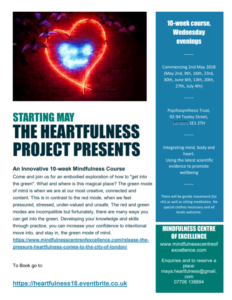 Home » Uncategorized » The Heartfulness Project Course Commencing (London Bridge) May 2018 ….. 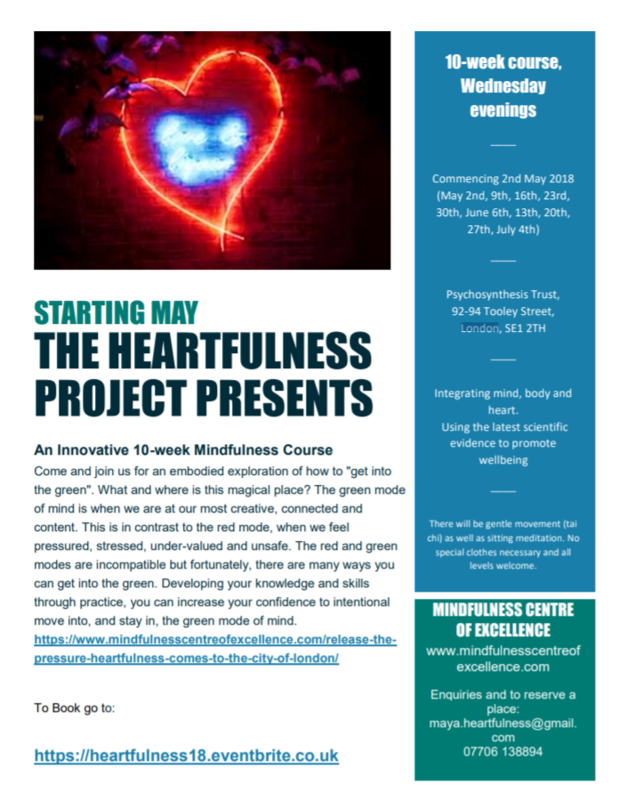 Following the success of The Heartfulness Project, conducted in 2017 in association with MSc students from King’s College London, we are happy to announce this new 10-week training program, commending May 2nd 2018 (London Bridge). You can find out more about the Heartfulness team and watch a video about the work here (or click below). 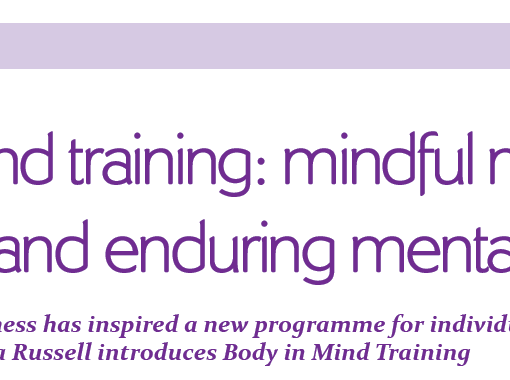 Developed by Dr Maya Campbell, research scientist and mindfulness teacher and clinical psychologist Dr Tamara Russell, the course draws Maya’s lived experience of a heart attack leading to heart failure. Subsequently Maya gave evidence at the All Party Parliamentary Select Committee on Heart Failure and argued for the need for greater psychological support for heart patients. Dr Tamara Russell, Director of the Mindfulness Centre of Excellence, brought her expertise in creative co-design of mindfulness programs to develop an innovative program which started from the experience of the participants. This makes sure that what is offered is really relevant and appropriate for the specific needs of those with concerns about how to keep their heart healthy and thrive. We are now accepting applications for the course. Contact maya.heartfulness@gmail.com for an informal discussion to see if this course is right for you. Combining these three means a powerful, integrative “mind-body” learning experience where you can safely access vulnerabilities and learn to work with them in a different way. The Heartfulness Project uses body and mind to generate embodied compassion. Pilot study Heartfulness Project Jan 2018 outcomes. May Course Flier is here. Booking for May 2nd course click here. The location of the Spring course will be over 10 consecutive Wednesday evenings (May 2, 9, 16, 23, 30, June 6, 13, 20, 27th, July 4th – 6.30 to 8.30pm). Note that June 13th session will be a unique experience taking our practice out into the world to explore the real-world applications of what we are discussing. The course was designed to help those who suffer from heart conditions or who are at risk of developing heart disease (e.g. : those with really stressful lives or a family history of heart disease), or anyone with an interest in developing their heart health. Given the close relationship between physical and mental health when dealing with the heart, this Spring course is open to anyone with an interest in working more deeply with heart health in an integrative way. The World Health Organization has predicted heart conditions as the world’s leading global killer. A key driver fro this program is the fact that much of this is preventable if people have the right facts, exercises and motivation. There is increasing interest in the benefits of tai chi for both mental and physical health – research is showing over and over again how helpful it can be for cardiac health, including more severe conditions such as heart failure. Check this short video for some information and also this one with the excellent Dr. Yeh talking about possible mechanisms. 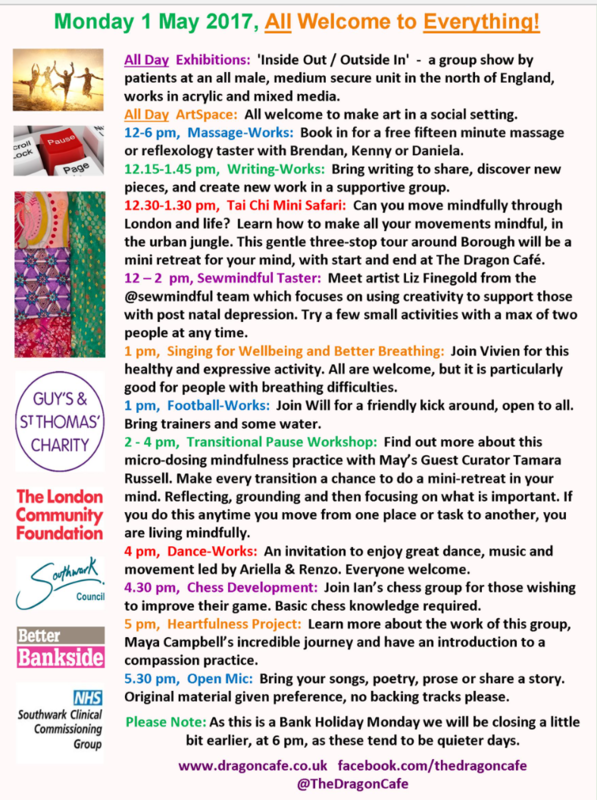 Over Feb and March the Heartfulness Team took part in four events at Shoe Lane Library as part of the City of London’s initiative Business Healthy, and Dragon Café in the City. We offered four stand alone workshops that drew on the content of the Heartfulness Course. Partcipatans found the tai chi relaxing, loved the science and took away some key practices to help them activate their soothing system and stay cool and collected (no matter what). Get into the Green – in this workshop, participants learnt the basics of Gilbert’s three modes model. They reflected on how they spend their time and determined which mode is their predominant way of living. For many of us, this is red (threat) and blue (doing and striving). Just getting to work can put us in the red. Our green mode (calm, contented, relaxed and safe) is often neglected. This is why we need help to figure out how we can get into the green and take care of ourselves. This has a positive impact on both our physical (especially heart) and mental health. We can use our mind and our body to help us get into the green. One small thing you can try right now ……become aware of your pace of walking. Notice if you are rushing, see if you can slow down and still cover ground but in a way that is more gentle for your body. Check what you are carrying (your bag), are you carrying it in a way that is gentle for your body. What about checking out Happy Maps – deliberately find a route to work that will bring a smile to your face and make sure you arrive in the green, rather than red as you start your day. The Courage to Care – Being compassionate is not a soft option. It requires us to really feel and experience what is going on but at the same time, be able to act wisely. Sometimes acting wisely means not doing anything or even, taking care of yourself. We often find this very difficult, especially those who work in the caring professions. Being and living with an open heart means that at some point, your heart will break. 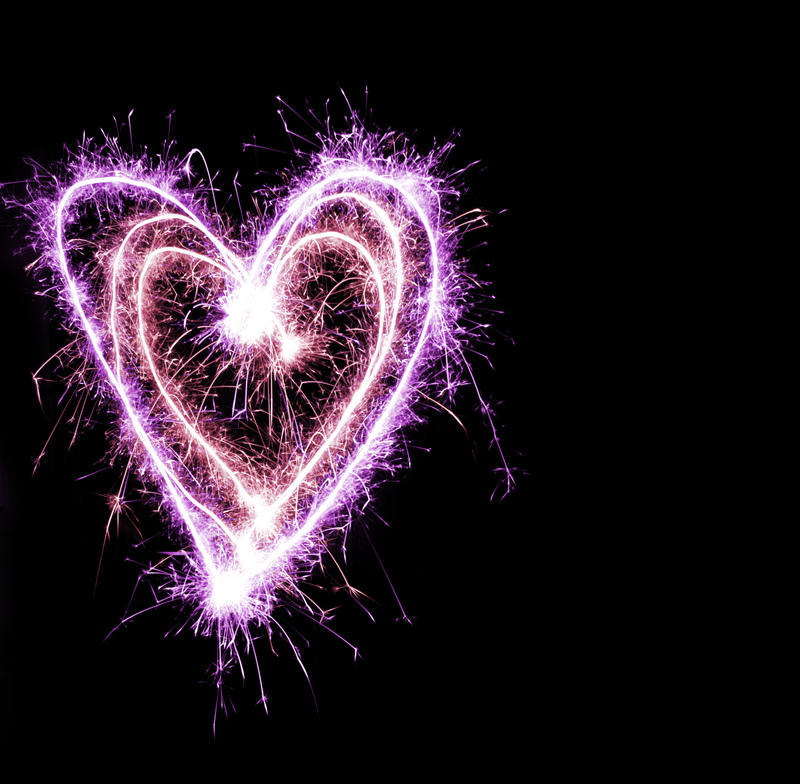 Having a broken heart means that it is likely your heart is wide open. Learning how to live in this way takes a great deal of personal strength and commitment. And yet, the benefits appear very quickly with this approach to life. One small thing you can try right now …… see if you can say for the next 15 mins or even 1 hour, you will make decisions where you will check in with yourself “is this kind?” This question may be in relation to yourself or someone else. Can you have a period of the day where you CHOOSE to make decisions that have kindness and care as their main intention or driver? Working with intention is really helpful as it tunes the mind prior to any decisions made. If you are interested in Intention join the Intention Matters Facebook group to keep abreast of Tamara’s new book (co writing with Juliet Adams). Turning your Inner Critic into an Inner Coach – working with the inner voice is a key part of the self compassion work. When we start to tune into the mind and what we are saying to ourselves on a regular basis we can get a shock. We are often relating to ourselves in a way that we would never dream of speaking to others! Part of this work then is to a) discover our habitual ways of relating to our minds, emotions and experiences; b) check that these are healthy and helping us get into the green (not putting us more in the red, that doesn’t make sense!) and c) deliberately choose an internal tone of voice and language that will support us and help us to move forwards. This can be helpful no matter what our circumstances. This is a beautiful film about how those with even very distressing internal voices can work with compassion. Heart-Teach (the Heartfulness Way) – there are lots of apps and devices out there now to monitor every aspect of our physiology. Maya showed participants the HeartMath system that she uses to help her monitor her heart. Most dramatically, she showed us traces from her heart in “normal” life and contrasted that with a trace from a time after she had been on meditation/self compassion retreat. Previous post Sharing Mindfulness at KPMG – #whatismindfulness @work?